Seating arrangements can be killer. If you’ve ever helped plan a wedding, you already know this: the last thing you want to do in the last weeks before a big event are sort through RSVPs and figure out if your Aunt Maude still has a grudge against her sister, and if so, where on earth can you fit her and Uncle Jeb? You just want to make everyone happy, but there’s only so much space to work with. It helps to have something to hold on to, cards or labels you can shuffle around. It makes it a little bit like a game. 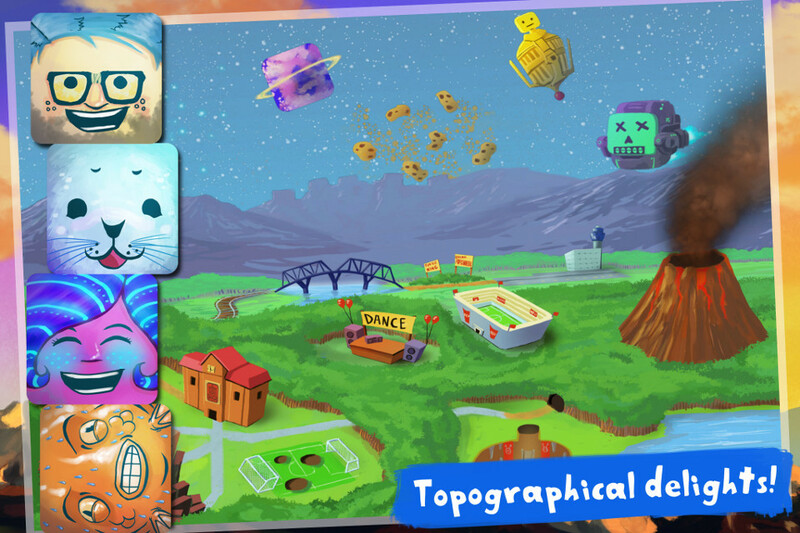 Someone at Popcannibal has clearly done some event planning in the past, because Girls Like Robots ($2.99) is the game of seating arrangements brought to utterly delightful life. Absent are the tensions of family dynamics, and in their place are schoolroom dramas: who likes whom, which one’s the pariah, and who would really just like to be left alone. Here’s a primer: girls like robots but they hate nerds. Robots are cool with just about everyone, but can’t be left alone with fish. And nerds? Well, they’d like to sit next to girls, but robots are pretty cool too. Hope that’s clear, because it’s just the start of navigating this social puzzle minefield. “Seating" is a loose concept here. You arrange your little friends as tiles on a grid. Each one — and there are far more than girls, robots, nerds and fish — has his or her own likes and dislikes which get revealed over time. If something beloved is on all four sides of a tile, it will be the happiest it can be. If it’s surrounded by the things it hates, there will be abject misery. Happiness is your goal and your currency, so you have to do your best to avoid making people unhappy and do your best to offset it when it’s unavoidable. Most of the Girls Like Robots‘ hundred plus levels are logic puzzles, but few have exact right or wrong solutions. Happiness is a spectrum. Some times you’ll fill a grid with thrilled individuals, and leave the happiness requirements in the dust. Other times you’ll mash the undo button over and over as you try to find the best of a bunch of despondent solutions. The game does everything it can to help you along — a happiness overlay that shows how well each edge is doing, the undo button, a level skip — but, puzzling out a satisfactory solution can be as complicated as seating the singles at a dinner party full of couples. No matter how complicated the puzzles get, though, there are a finite number of rules you’ll have to deal with. This could have left the game grinding to a halt somewhere south of a hundred levels, but Popcannibal had a plan: variety. Each of the game’s three worlds has a different theme. And each segment within those worlds has its own challenges. The scenarios spread out like wildfire. Some give you a set number of moves to swap tiles. Some make your tiles disappear as soon as you make them happy. One unusual set has you bouncing bug tiles off their friends as they fly in from the sides. These barely scratch the surface. Nearly all of these scenarios are great fun, and they’re tied together with charming, funny little scenes that build into quite the bizarre tale. As one might expect from a game published by Adult Swim, Girls Like Robots is full of humor, generally of the dry variety, and it rarely does what’s expected of it. A cute story of young love takes a diversion into a train fleeing a volcano, onto a farm of overly-friendly cows, and up into the sky—and those are just a few of the stops. It’s all tied together with gorgeous, painterly art. The backdrops to each level, the character tiles, the map, the cinematics — every piece is beautifully rendered. There’s a homespun feel to the game, brought out by the banjo and bluegrass soundtrack. The humor slips into the visuals, too, in the facial expressions, environments and even the markers that track your success. 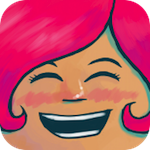 Let me be blunt: this game is a joy to play. Making these adorable little fellows happy is a delightful experience. 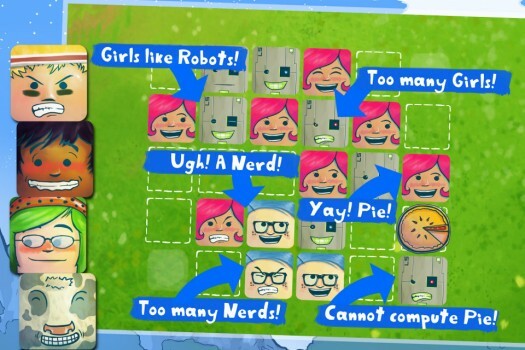 If you like happiness (and puzzles, I suppose), you’ll enjoy Girls Like Robots. The single thing that bothered me during my time playing it was that you can’t undo your final move in a given puzzle, a limitation that doesn’t quite fit in. Otherwise, I never stopped enjoying myself. Making seating arrangements this fun is an impressive feat, and I’m left feeling that Popcannibal knew just want to place in front of me to make me as happy as can be.